Hog Island – Chesapeake Chapter U.S.L.H.S. 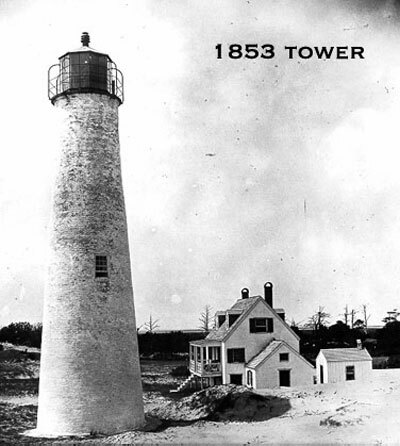 The first Hog Island Lighthouse was built in 1852 and was a white conical brick tower. 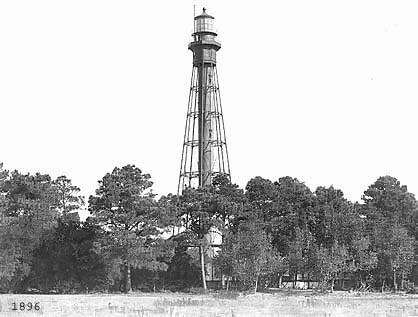 This lighthouse lasted until 1896 when it was replaced with a cast iron pyramidal skeletal tower with a central cylinder. This lighthouse was similar to the Cape Charles lighthouse today. Both lighthouses were built on what was the southern end of Hog Island. Hog Island was the northern most part of the natural barrier islands between the Virginia’s Eastern Shore and the Atlantic Ocean. on the tower. Most of these islands are owned by the Nature Conservancy and completely uninhabited. What’s left is now part of a bird sanctuary. The 10-foot high lens, a first order produced by the Henry-LePaute company in France, was removed from the lighthouse before the final destruction of the facility. It was loaned to the City of Portsmouth, VA and is now on display on the Portsmouth Seawall. For more information you can visit the Portsmouth Visitors and Convention Bureau’s website at http://www.portsmouth.va.us/tourism/attractions.htm or call 1-800-767-8782.